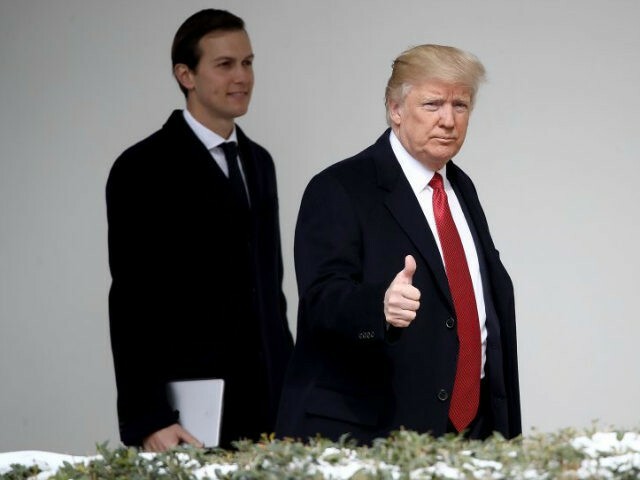 On Thursday’s Breitbart News Daily, guest Peter Schweizer talked about President Trump’s son-in-law, Jared Kushner, and his role in the controversy over meetings between Trump transition team members and various foreign interests. On Wednesday, Kushner Cos. and the Anbang Insurance Group of China reportedly agreed to end talks about securing investment in an office tower on Fifth Avenue in Manhattan. The deal had been criticized as an effort by the Chinese to win favor with the Trump administration. “The biggest concern that I’ve had is whether Jared Kushner, whether it’s the president’s sons who are running the real estate business, that they are going to be offered or they are going to seek out sweetheart deals with foreign government entities – Chinese, Russian, Kazakhstan, you name it,” Schweizer told SiriusXM host Alex Marlow. “That’s where the vulnerability is, because they will make a killing financially, and a foreign entity will then gain leverage or favors from the Trump administration,” he said. Peter Schweizer is a senior editor at large for Breitbart News, president of the Government Accountability Institute, and author of the best-selling Clinton Cash: The Untold Story of How and Why Foreign Governments and Businesses Helped Make Bill and Hillary Rich.